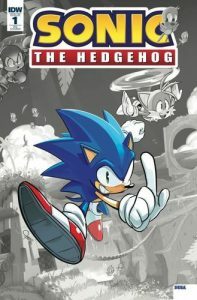 The old phrase “The more things change, the more they stay the same” has never been more true when it comes to the return of Sonic in comics in IDW’s “Sonic the Hedgehog” #1. After being gone from comic shelves for over a year thanks to a fallout between Sega and Archie, Sonic’s found a new home with IDW. But the creative team has not left. This issue features a story by Ian Flynn, along with Tracy Yardley on pencils, Jim Amash on inks and even Matt Herms doing the colors. IDW knew the strength of the Archie Sonic books for the last ten-plus years was the strength of it’s creative team, so it only made sense to bring them all over. So what’s different? Well, for one thing this is a full reboot focused primarily on Sonic as the main character and taking place in the game universe (but not canon to the games themselves). There’s no Mobius, no Ixis Naugus, no Freedom Fighters (yet) and no baggage from over twenty years of continuity. MINOR SPOILERS AHEAD! (Please note that this is the start of a new story arc so there’s not a lot to spoil.) 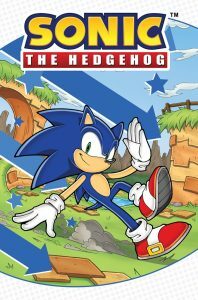 The comic is adapted from “Sonic Forces” and takes place after the end of the game. Eggman has been defeated and is currently missing, but his robot army has been on auto pilot without him. Most of them have been only a minor threat with some going off blindly and even walking right into the ocean. However, after some more difficult bot battles, Sonic and Tails have noticed that the robots seem to be more organized. Has Eggman returned or is there someone else at the controls? With Eggman not appearing until issue five, I’d say it’s the later. The main plot is almost background fodder for the bot-kicking action of Sonic and Tails. The book does a good job of showing off their camaraderie. Sonic is arrogant and full of bravado while Tails mostly uses his wits and fights alongside Sonic in a few scenes. One scene worthy of note is Tails worrying about Sonic getting into too much danger. While those who have never played Sonic Forces may see him as being a bit of a worry wort, those who played the game and know what Tails went through will get a bit more character depth out of the scene. I also like how the citizens react to Sonic. While there are some resistance fighters, most are inexperienced and scared. They see Sonic as not only a hero, but a celebrity of sorts. They gush over him and want his autograph. Tracy, Jim and Matt haven’t lost a step. The art’s great and the colors really make it pop. One minor complaint is that the paper stock is a bit too stiff and crinkly for my tastes. While re-reading for this review in the quiet comfort of my home, every turn of the page was extremely loud with more crackles and pops than a bowl of Rice Crispys. Basically the paper stock used for the cover is used for every page. I know it’s a weird critique to make, but it’s true. Also, while the inks and colors are very bold, the print is a bit dark. They use dark purple borders around the panels and Sonic himself even seems a darker blue. I don’t know if this is on purpose or the printing just came out too dark. I will say it does look sharper than Archie’s prints. While yes, your favorite creative team is back, it does lead to this feeling of the book being new but not fresh. It’s as if I haven’t picked up the Archie book in over a year and just came back in at the end of a game adaption story arc. It may not be the same world or all the same cast, but it doesn’t feel much different. That doesn’t mean it’s a bad thing. I imagine most fans wanted Ian, Tracy, Matt and all the others back on board. I did too and I’m glad they returned. But those who may have been looking for a brand new Sonic experience like they’ve never gotten before probably won’t find it here. One thing I’ll say is that I do really like the new fan section “Sonic Letters Squad”. Not only does it include letters and fan art, but they are also posting pictures of fans in their cosplay. It’s nice that this is starting with issue one. I also hope they bring back a form of “Off-Panel” in the future or allow fans to make their own little comic strips for the back of the comic. Overall, while IDW’s Sonic does feel more familiar than fresh, the new comic is off to a great start. There’s plenty of action, character interaction, fun and a bit of mystery to hook you into the next issue. Let’s hope Sonic gets another twenty year run at his new home. Being in the UK, I had to wait a bit to get my copy, but I finally got it today. And I’ll be honest: it’s a solid if unspectacular start. 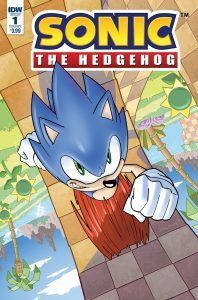 It was a little lighter on story than I like, but the story that’s there is good, and overall it was a pleasant read with a few good chuckle moments and a healthy Sonic-Tails dynamic, and a good foundation stone to build the series on. I just wish it had something to lift it from ‘good’ to ‘great’.